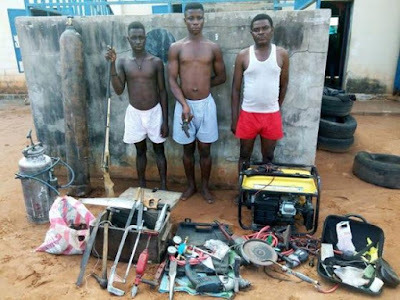 Report has it that two suspected thieves who have been terrorizing residents of Ijagun area of Ogun State were arrested on May 25. 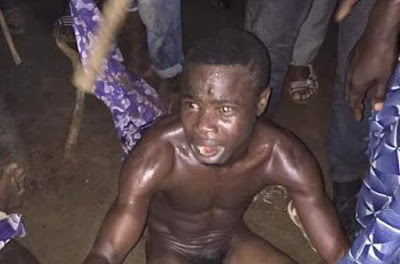 According to Oluwasanmi Adedamola, the suspects often go round to different female hostels to steal laptops, phones, clothes and other valuables at gunpoint. They were also said to have raped some of their victims, students during the attacks. It is a common saying that every day for the thief, one day for the owner. The moment you get yourself involved in all these nefarious activities, you’re finished. So be careful the type of friends you keep. Some, when they are nabbed will more often than not blame it on devil. And of course, you don’t blame it on employment. Why? Stealing is not the best option of not getting a job. There are thousands of genuine things you can get yourself engaged in. Ultimately, know the type of friends you keep. Do not succumb to peers pressure. Be contented with what you have. Not all that clatters are gold. Good name is still better than riches. I know most people will argue on this, but don’t either because it’s a fact. When your source of income(s) is genuine, you don’t have anything to fear. Like I said, avoid every forms of demonstration effects. Don’t do something because Mr A does it even when you don’t have the resources or the purchasing power. Be yourself and you’ll live a clean life. Some of us failed to understand that some people you see living flamboyantly are heavily indebted. They can do anything to maintain high life style. Deep inside them, they are not finding it funny. Unfortunately, because you don’t know what they are passing through right inside, you want to be like them. NO! Be yourself. You’re so unique by nature. Check your nose if it looks likes that of Mr A. It’s not! How about the face? Not at all! You see how unique God has created us. It is because we always want to follow the crowd; and that is where most of our challenges are. You’re unique! Don’t bring disgrace to yourself and your family. The rule of engagement on whistle blowing policy is there for anybody to access. This becomes necessary as cases of people raising false alarm are becoming rampant. The other time, it was two guys in Borno state, and now another false alarm on Ekweremadu’s Guesthouse. Would it be wise to pull another man down unjustly, just because you want to make money? And people may be asking why would the police charge false whistle-blower to court. Yes, the police have to; otherwise people will abuse the policy. Check your fact, carry out your investigation, confirmed it’s true before you raise alarm. That is simply what the police are telling those that are in fond of giving misleading information. Meanwhile, on Tuesday, the Nigeria Police Force charges a 50-year-old man, Ahmed Echodo to court for allegedly giving false information to police to conduct a raid at a guest house building which was allegedly owned by the Deputy Senate President, Ike Ekweremadu. In the one-count charge, two defendants were accused of the offense, even though only Ahmed Echodo was charged at an Abuja magistrate court. Security operatives it was said ransacked Ekweremadu’s building on Friday morning following information accusing the occupants of criminal offenses. The police, however, found nothing incriminating after the search. Meanwhile, security officers at the building located close to the Ganges Street, Maitama, Abuja told Premium Times, the raid was carried out by police officers on the instruction of the Inspector General of Police, IGP, Ibrahim Idris. 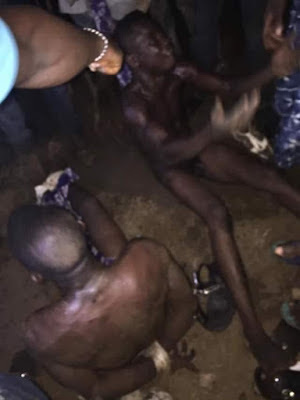 Moshood Jimoh, police spokesperson, however denied it and said that the police on Tuesday charged the two men on a one-count of misleading the Nigeria Police. In accordance with the charges, Mr. Echodo and Maiwada Adamu are accused of conspiring to falsely inform the office of the IGP that the building, occupied by Oliver Ogenyi is being used for criminal activities as well as in storing of arms and ammunition. 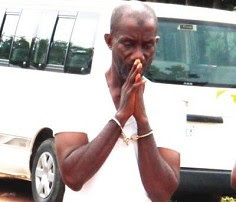 Mr. Adamu, the second accused, was not in court while the first defendant pleaded not guilty to the offence. Ismail Tawo, the prosecution counsel told the court that Adamu was at large. However, the magistrate, Umar Kagarko told the police to find Mr. Adamu and present him in court at the next sitting. Counsel to the defense, Peter Ngwoke prayed the court to grant his client bail. Meanwhile, Mr. Kagarko has adjourned the hearing till June 5, for ruling on the bail application. 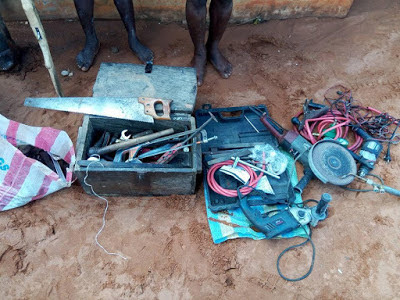 It was during investigation that the suspect led the police officers to an arms manufacturing factory at Tse-tyungu Kyado district of Ukum LGA of the state. Sequel to that, two suspects, Purga Tyowa 25yrs and Aondoyavenga 18yrs were arrested. Meanwhile, some items recovered from the factory operators includes items used in the fabrication of the locally fabricated firearms. These items include: 1 carbon cylinder, 1 gas cylinder, 1 sumec generating set, 1 Dane gun, 1 fabricated pistol, 1 filing machine, 1 drilling machine, 2 saws, 1 tool box, 1 Bagco bag containing tools and 1 Bajaj motorcycle. According to the police command, the suspects would be charged to court as soon as investigation is completed. 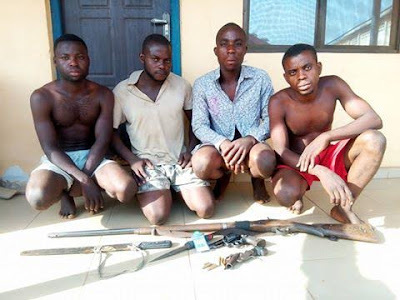 Benue State Police Command's Operation Zenda Special Crack Squad reportedly acting on a tip off info break-in a criminals den at Adamgbe Tse-lyssa community along Benue - Taraba border on May 15, arresting four criminal suspects. The suspects name was given as Saayua Abashed, Isaac Usafa, Godwin Terlumun, and Aondohemba Abum were reportedly residence of Benue and Taraba states. Meanwhile, some items recovered from them includes one locally made pistol, a chief revolver pistol with breech no. 44K 7755, one single barrel Dane gun and six expended AK47 ammunition. The suspects admit to be responsible for many of the armed robbery cases in parts of Benue and Taraba states. The suspected criminals also admit plans to attack Zaki-Biam yam market before their arrest. According to the police, the suspects would soon be charged to court as soon as investigation is concluded.